The ZOLL-SPED Spedition and Service Ltd. within the tender NYDOP-1.3.1/D11 built up a chemical plant. The Zoll - Sped Ltd has gained a 94 696 187 Ft grant on the "Site-development" tender. With a sum of 190 million Ft investment the company is able to develop a system suitable for international levels. The Zoll-Sped Kft. was established in 1991, to operate as a Customs Service area, with a crew of 6. In 1994, a new office building was built, and a new site was opened in Sárvár. Two years later the company was present in Vasvár as well. Meanwhile the manpower was also growing continuously. 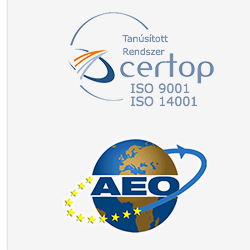 In 2001 a new relationship has begun with Epcos AG, which demanded significant quality requirements, allowing us to plan and implement sophisticated quality management system, with the necessary developments and trainings. Thanks to the long-term contract, with an environment friendly attitude, the thought of the Chemical Plant was concluded. In Vas county, apart from Epcos, numerous corporation function with a need of fire- and explosion hazardous, or psychotropic materials. These goods can be only stored, handled, prepared in a plant which satisfies the various regulatory requirements and fire safety regulations and be transported in accordance to ADR regulations. Moreover our system needs to meet the up-to-date standards of a modern international company. The implemented project facilitate these environmentally conscious processes in a safe environment. Title: "Vegyi üzemcsarnok létesítése gyanták egyedi igények szerinti gyártására"